Musical Koala bear entrepreneur Buster Moon inherited a theatre from his father but the business has steadily gone into decline and now creditors are haranguing Buster to settle his spiralling debts. In order to general interest in the theatre, Buster organises a singing competition with a 1000 US dollar prize. Unfortunately, his elderly iguana assistant Ms Crawly mistypes the value of the top prize on promotional posters, sending the city into a frenzy of excitement. 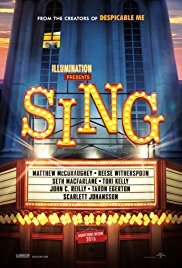 Sing is not currently showing anywhere.